A fresh, juicy cocktail of zesty limes, kiwis and crisp apples, Leading to a peaches & cream heart with floral accents of lily and jasmin, finishing with soft vanilla and musk. 42090 (Blue 1), CI 77000 (Aluminum Powder). This soap is fun for all of the family. I bought this for the kids to use as something fun for bathtime and they love it. 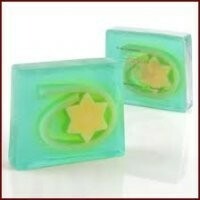 The scent is really nice and zesty, the bar looks so fun with the star and the lines inside.